Well, the graduation has come and gone. The last cooler is dried out, the chairs are all put away - but still need to be returned to their owners, and the leftovers are socked away in one of our two refrigerators. It was a great, great day. 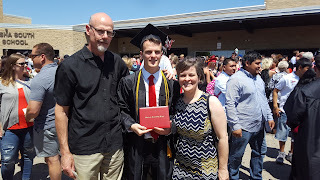 If you've been following me, the focus of many of these last few blogs has been the preparation going into the big event - Ben's high school graduation. To say that Donna and I have been maxed out these past four weeks in preparation is an understatement. There was an ongoing "list" of things that needed tending both indoors and out. We clicked them off one at a time and I'll be danged if we didn't hit them all. When GO time arrived, everything came together. Thankfully a friend loaned us a pop up tent and we were able to use it to keep the sun off of us. The weather cooperated and, as I said, it was a great day. From there it was back home and putting the house back in order in preparation for more family coming in tonight. My sister in-law and her two girls are coming for an overnight on their way to visit colleges for Mandy, her youngest. The house is presentable again and ready for another brief celebration. In the process of all of this work, I've been re-enlightened as to the rigors of parenthood. We work and work and work to give our kids a leg-up. We want them to be happy, fulfilled and successful. 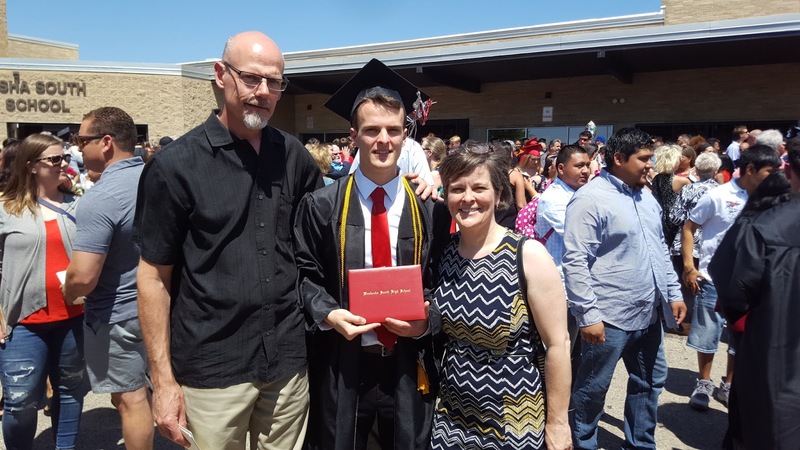 You think once you're out of the grade school years it gets easier, and in some ways it does, but you're still a parent. Then, high school sets in and there's the emotional/intellectual growth and struggles that go with it - work in a different sort of way. Then, senior year it's all about prep for the next chapter, college, tech school, work or military. You hound and nag because you want them to have what you had. Parenting is a full-time, lifelong, exhausting and fulfilling labor of love. And when the graduation day came and I watched my son interacting with his friends, I can safely say, it was all worth it. He is courteous to everyone, well liked, engaging and kind. And on that same day when he reached out and hugged my wife and thanked her for all she's done for him this past year, I kind of got a lump in my throat. And later when he hugged our good friend Jill, and told her he loved her and uncle Steve, well, I think to myself, who told him to do that? After some though I realize it was now part of his nature to be grateful for what he has been given. And being grateful requires humility - if you're doing it right. A bit later he walked away from his friends for a bit and took time out to come up and talk to the adult circle. He was working the crowd, part out of obligation, but partly because he loves each and everyone that came to recognize his accomplishments. I don't know what the next four years will bring while he's away at Madison for school, but I'd have to say he's off to a great start in life. While we will continue to worry, and work, and pray and encourage him, because that's what parents do, I think he's going to prove that the foundation we've set will help him reach for the stars. Nice Jim. Good story telling the past few weeks and congrats to both your kids. Oh and congrats to the parents too.